PlantCV is composed of modular functions that can be arranged (or rearranged) and adjusted quickly and easily. We hope that you can use these functions and pipelines as a starting place for your project. The goal is to provide practical examples of image processing algorithms. Pipelines do not need to be linear (and often as are not, as seen in this example). A global variable "debug" allows the user to print out the resulting image. The debug has three modes: either None, 'plot', or 'print'. If set to 'print' then the function prints the image out, or if using a Jupyter notebook you could set debug to 'plot' to have the images plot to the screen. Debug mode allows users to visualize and optimize each step on individual test images and small test sets before pipelines are deployed over whole datasets. 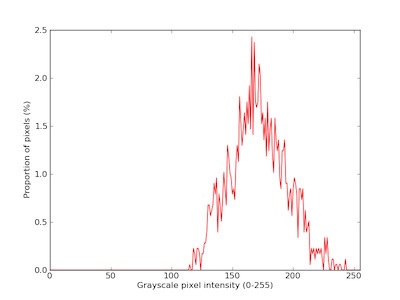 Image: NIR images are grayscale matrices (1 signal dimension). In principle, image processing will work on any grayscale image with adjustments if images are well lit and there is appreciable contrast difference between the object of interest and the background. Output directory: If debug mode is set to 'print' output images from each intermediate step are produced. 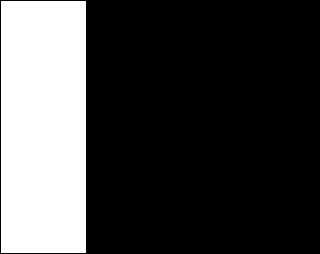 Image of estimated background: Right now this is hardcoded into the pipeline (different background at each zoom level) and not implemented as an argument. 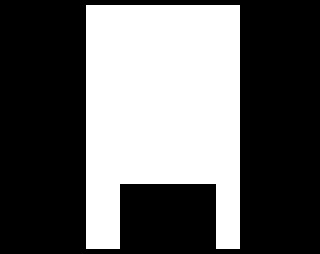 The image selected by the -i flag is read in. Figure 1. (Top) Original image. (Bottom) Background average image. Note: Sometimes it is easier to use pre-built OpenCV functions. In most situations the documentation is quite good. However for more complex operations (those that require multiple OpenCV functions), I would recommend writing a PlantCV subroutine. First, let's examine how efficiently we can capture the plant. Then we will worry about masking problematic background objects. We start by subtracting the background. 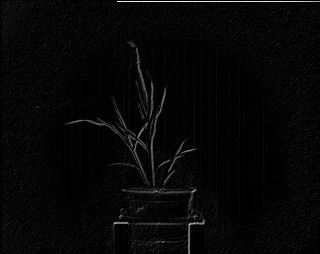 # Subtract the background image from the image with the plant. Figure 2. (Top) Image after subtraction of average background pixels. 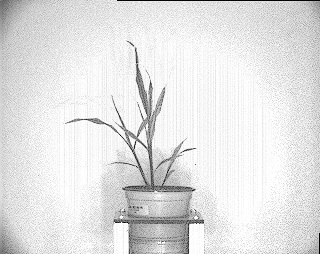 (Bottom) Image after two-sided thresholding applied to isolate plant material. 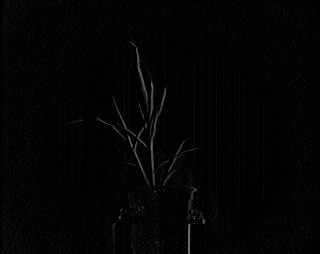 Images were subtracted using the PlantCV image subtract function. This function is built using the numpy '-' operator. It is a modulo operator rather than a saturation operator. 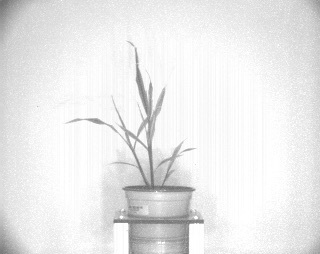 Thresholding was done using the OpenCV inRange function. 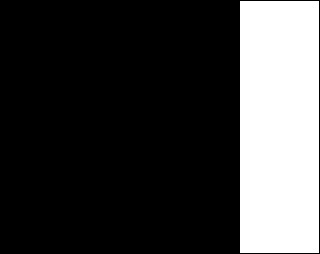 Pixels that have a signal value less than 50 and greater than 190 will be set to 0 (black), while those with a value between these two will be set to 255 (white). This approach works very well if you have image of the background without plant material. We can use the Laplace filter, an image sharpening approach, to improve object of interest thresholding. 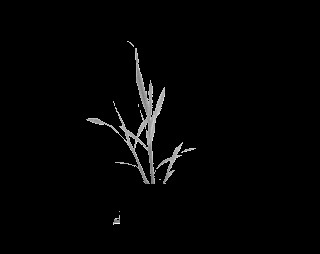 This will improve your ability to maximize the amount of plant material captured, and it is particularly useful if estimating background pixel intensity is problematic. Figure 3. 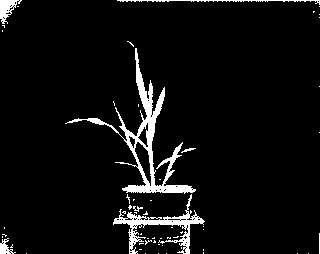 (Top) Result after second derivative Laplacian filter is applied to the original grayscale image. (Bottom) Result after subtracting the Laplacian filtered image from the original image (sharpening). 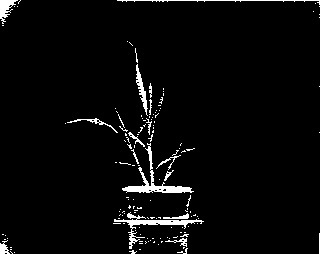 Subtracting this filtered image from the original image will increase the contrast between plant and background if the border between the two objects is distinct. 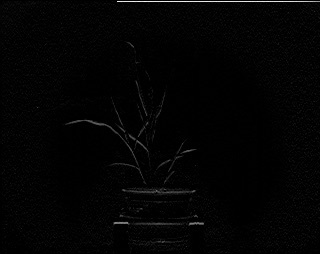 Notice the plant is darker in this image than it was in the original image. We can apply the Sobel filter to each axis. Then we use the image addition function to combine the results of each filter. Figure 4. From top to bottom: Result after first derivative Sobel filter is applied to the x-axis of the original image; Result after first derivative Sobel filter is applied to the y-axis of the original image; Result after adding the two Sobel filtered images together. First derivative Sobel filters highlight more ambiguous boundaries within the image. These are applied across each axis individually. Combining both Sobel filters images through addition highlights these regions where the texture changes across both axes. 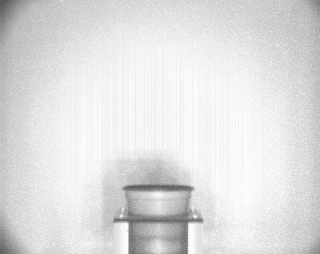 Next, we apply the median blur function to smooth the image, and then invert the image. We then add the images together and use the binary threshold function. Figure 5. From top to bottom: Median blur; Sobel filtered image after application of a median blur filter and inversion; Resulting image after adding the image on the right to the Laplacian sharpened image; Resulting image after binary thresholding of sharpened image. Median blur filtering decreases the amount of noise present in Sobel filtered images. 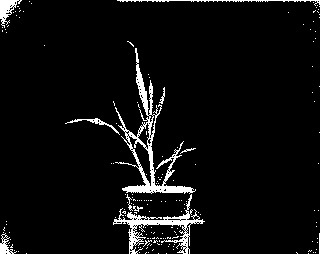 Adding this (inverted, Sobel filtered) image to the Laplacian filtered image further increases the contrast between the plant and background. 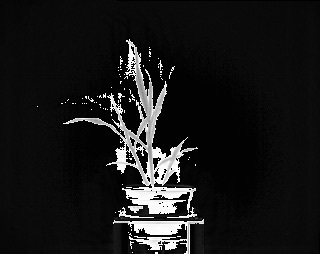 Increased contrast enables effective binary thresholding. Next, we erode the image to reduce noise. Figure 6. Erosion with a 3x3 kernel. Erosion steps help eliminate background noise (pixels called plant that are isolated and are part of background). 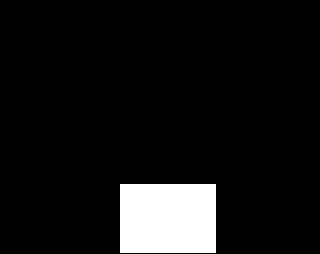 The focal pixel (one in the middle of the 3X3 grid) is retained if the corresponding other pixel in the kernel non zero. 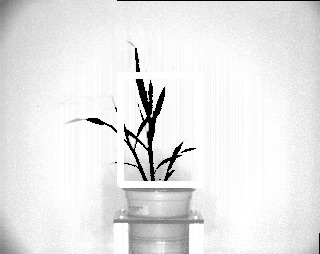 Merging results from both the background subtraction and derivative filter methods is better at capturing the object (plant) than either method alone. We achieve this with the logical or function. Then we apply the mask. # Bring the two object identification approaches together. # Using a logical OR combine object identified by background subtraction and the object identified by derivative filter. # Get masked image, Essentially identify pixels corresponding to plant and keep those. Figure 7. (Top) Logical join between binary images. (Bottom) Original image masked with binary derived from the logical join of both methods. The background subtract method does a good job of identifying most of the plant but not so good where leaves meet stem. The derivative filter method does a good job of identifying edges of the plant but not so good identifying interior of leaves. Combining these methods improves our ability to capture more plant and less background. We can remove unwanted parts of the image using a rectangular mask function. Figure 8. Use rectangle masks to remove parts of the image. From top to bottom: Make a mask to hide the pot; Make a mask to hide left panel; Make a mask to hide right panel; Make a mask to hide the edges of the image. Making image masks is a very useful method to ignore/remove objects in your image that are difficult to remove through thresholding. Note that the top left corner has coordinate values (1,1) and these coordinate values increase as you move right and down (row, column). Next, we use the logical or function to combine the masks. Then the mask is inverted and applied to the image. # invert this mask and then apply it the masked image. Figure 9. (Top) Combined background masks after inversion. (Bottom) Masked image from above after masking with background mask. Note the plant is almost entirely isolate from the background. Now we use the find objects function to find contours of the plant. We define a rectangular region of interest to capture only the objects (contours) that are partially within the ROI. Figure 10. (Top) Select an area where you expect the plant to be. (Bottom) Plant falls within area so include all continuous portions within the plant that fall within the area of interest (rectangle). 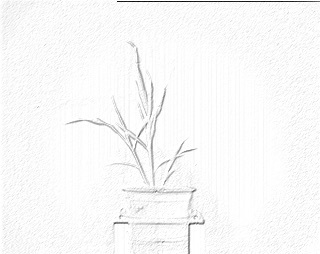 We can use the object composition function to outline the plant. Figure 11. 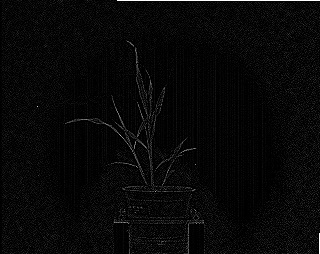 This is an outline of the contours of the captured plant drawn onto the original image. 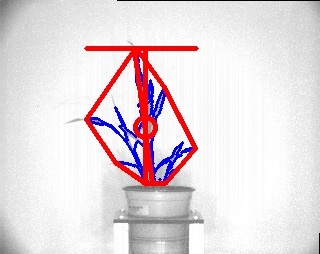 Now that the plant has been separated from the background we can analyze the pixel composition and shape of the plant. 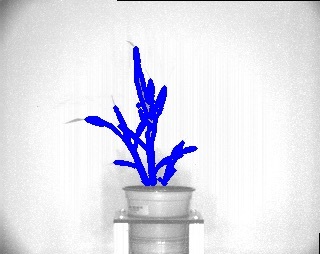 In order to pseudocolor the plant by signal intensity the image needs to be converted from grayscale (1-dimension) to pseudocolor (3-dimension). 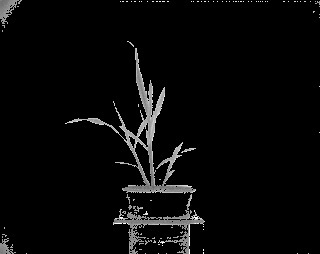 This is done by replicating the grayscale image 3X and combining them into a single 3-dimensional matrix (rgb_img = cv2.cvtColor(img,cv2.COLOR_GRAY2RGB)). All masks, countours, etc... need to be converted to 3-dimensions for pseudocoloring. Now we can perform the analysis of pixelwise signal value and object shape attributes. Figure 12. 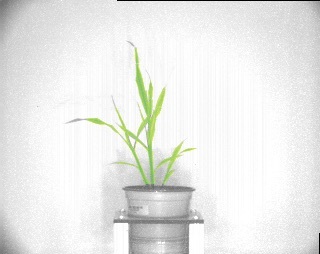 From top to bottom: A image of the object pseudocolored by signal intensity (darker green is more black, yellow is more white); Shape attributes of the plant printed on the original image; Histogram of the signal intensity values.